Sometimes Oscar even gets it (mostly) right: The Hurt Locker cleaned up with six awards last night, including best picture, best director (Kathryn Bigelow), and best original screenplay (Mark Boal). Bigelow had been widely expected to win for her direction of the riveting Iraq War drama, and in so doing she became the first woman to take home that award. But most Oscar guessers were about evenly split on whether best picture would go to her film or James Cameron‘s extraordinarily expensive and extraordinarily profitable 3-D sci-fi spectacular Avatar. The better film won in both top categories, IMO. Boal’s win was a bit of a surprise, as some had expected that Quentin Tarantino might take a home win in this category, for his violent, funny, wildly imaginative Inglourious Basterds. QT’s film, though, only won in the category of supporting actor (Christoph Waltz). An even bigger upset was in the category of best adapted screenplay, with Geoffrey Fletcher winning for his adaptation of Saffire’s tough-but-uplifting urban drama Precious. The majority of the categories played out about as expected, although it was interesting to see another left-field choice win in the foreign-film category: Argentina’s The Secret in Their Eyes trumped two wildly acclaimed films — The White Ribbon and A Prophet. Tallies: The Hurt Locker won 6 out of 9; Avatar won 3 out of 9. Precious (6 noms), Up (5 noms) and Crazy Heart (3 noms) each won 2. Inglourious Basterds won 1 out of 8. Shut out: Up in the Air (6 noms), District 9 (4 noms), Nine (4 noms), An Education (3 noms), The Princess and the Frog (3 noms). How’d I do? I made predictions in 15 categories. I guessed wrong in four. Score: 11/15. Best Picture – The Hurt Locker. My guess: Avatar. Best Director – Kathryn Bigelow, The Hurt Locker (my guess). Best Actor – Jeff Bridges, Crazy Heart (my guess). Best Actress – Sandra Bullock, The Blind Side (my guess). Best supporting actor – Christoph Waltz, Inglourious Basterds (my guess). Best supporting actress – Mo’Nique, Precious (my guess). Best animated feature – Up (my guess). Best documentary – The Cove (my guess). Best foreign language film – The Secret in Their Eyes, from Argentina. My guess: The White Ribbon. As I said – plenty of wild cards in this category, and one of them won. Best adapted screenplay – Geoffrey Fletcher, Precious. My guess: Jason Reitman and Sheldon Turner, Up in the Air. 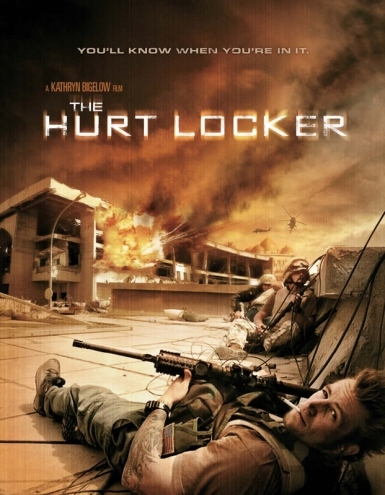 Best original screenplay – Mark Boal, The Hurt Locker. My guess: Quentin Tarantino, Inglourious Basterds. Best music (original song) – “The Weary Kind,” by Ryan Bingham and T Bone Burnett, Crazy Heart (my guess). Best art direction – Avatar (my guess). Cinematography – Avatar (my guess). Visual effects – Avatar (my guess). For the complete list of Oscar winners and nominees, click here. I recently reviewed That Evening Sun, a Southern drama featuring one of Hal Halbrook‘s finest performances, for Las Vegas City Life. Read the review, below, or click here to link to it. Hal Holbrook, Ray McKinnon, Walton Goggins. Directed by Scott Teems. 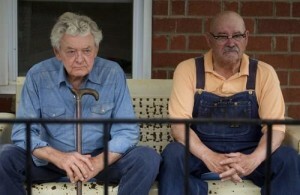 Dying is easy enough, particularly for veteran screen and stage actor Hal Holbrook. But Southern culture is hard to get right. For every perfectly turned piece like Goodbye Solo and Junebug, there’s a patronizing moral-lesson crowd pleaser like The Blind Side or a lame redneck comedy like Joe Dirt or a case of Southern-gothic overkill. Scott Teems, for his feature directing and writing debut, deftly avoids those traps with a drama built on a slow-burning fuse, an increasingly bitter feud between an octogenarian and his old homestead’s current ne’er-do-well occupant. Teems, not coincidentally born in Georgia, adapted his screenplay from a William Gay short story, and mostly gets it right, aside from several sentimental flashbacks that add little to the narrative. Holbrook, now 85, following his touching turn in 2007’s Into the Wild, is a late-career revelation as Abner Meecham, a retired farmer who has escaped a depressing nursing home and resettled on his old property in rural Tennessee. Trouble is, Meecham’s workaholic lawyer son, Paul (Walton Goggins), has already leased the rambling clapboard home and farmland to Lonzo Choat (Ray McKinnon), a 30ish local man with some demons of his own, including a chip on his shoulder and a propensity to turn violent when he drinks. Meecham and Choat probably have more in common than they’d like to admit, including dysfunctional relationships with their respective spouses and offspring; to his credit, Teems avoids a heavy-handed approach in observing those commonalities. Choat, tattooed and long-haired, clearly could overpower the old man. But Meecham has weapons at his disposal, including steely determination, a friendship with Choat’s kindly teenage daughter Pamela (Mia Wasikowska), and, yes, a gun. In one of the film’s several dry comic elements, there’s a scruffy dog that just won’t stop barking. For moral support, Meecham has his old friend Thurl Chessor (Barry Corbin, memorable in a small role), with whom he trades barbs on the latter’s front porch. Day by day, Choat’s anger at the interloper builds, as does Meecham’s resentment at being cut off from his home, and his furniture, all linked up with memories of his late wife, Ellen (Dixie Carter, Holbrook’s real-life wife). One of several well-observed moments has Meecham wandering around his old place, looking with disgust at the dirty walls and unkempt rooms, haunted by thoughts of the house’s former appearance. He burns with bitterness and regret over all he’s lost. Choat, having spent a lifetime being rejected by Meecham and others like him in their small community, is furiously working at a last-chance opportunity to make a good living for his wife, Ludie (Carrie Preston) and their daughter. Meecham represents an obstacle to that plan, an annoyance who refuses to budge. Thankfully, Holbrook’s performance is absent of any conventional crustiness or curmudgeon-with-a-heart-of-gold sappiness. Meecham is a tough guy, proud and taciturn, determined not to lose the battle of wills. As his life’s last war goes on, a sense of dread begins to build, and it’s pretty clear that a violent confrontation is unavoidable. But like everything else in That Evening Sun, there’s little about that clash that’s predictable.